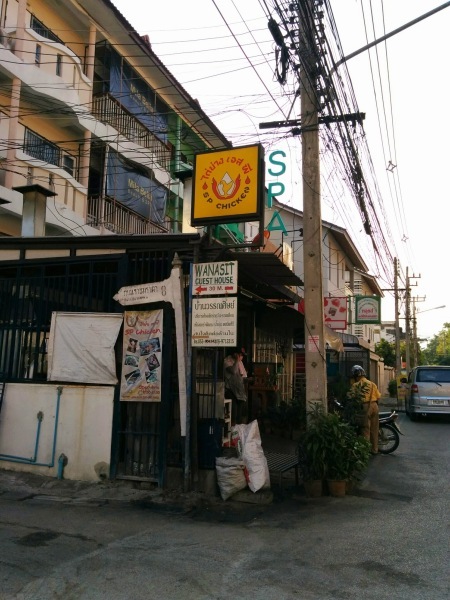 Although SP Chicken is situated steps from the famous Wat Chedi Luang, you would pleasantly surprised to find the restaurant comfortably empty around lunch time, populated primarily by locals in the area. It’s a different story at dinner where it’s pretty much a full house anytime past six o’clock. When you first enter the restaurant, you’re greeted by a sizable rotisserie stacked with whole chickens slowly spinning on diagonal trajectories. 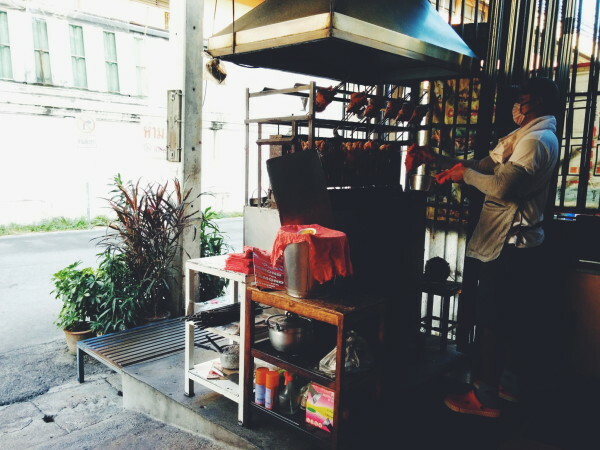 A man behind the rotisserie expertly tends to the chickens, placing them at the correct distance from the charcoal grill, periodically removing the birds to ensure no traces of charcoal sit on the skin for too long. The fragrant smell of chilies, garlic, onions, lemongrass permeate the air. I’ve got to say our first experience with SP Chicken was pretty unforgettable – that’s why we came back again for dinner on the same day. 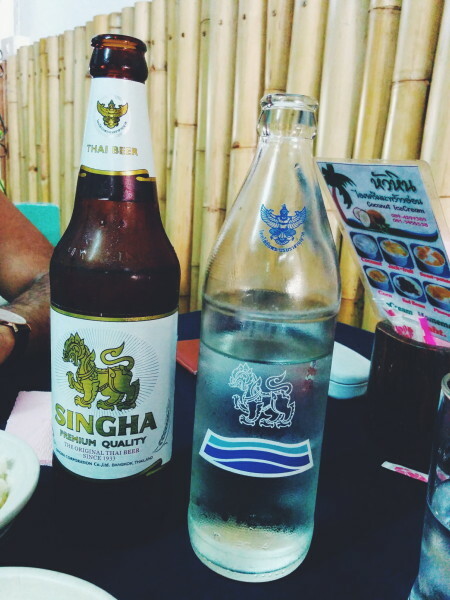 To cool off from the heat outside, cold Singha beer and cold Singha water were in order. 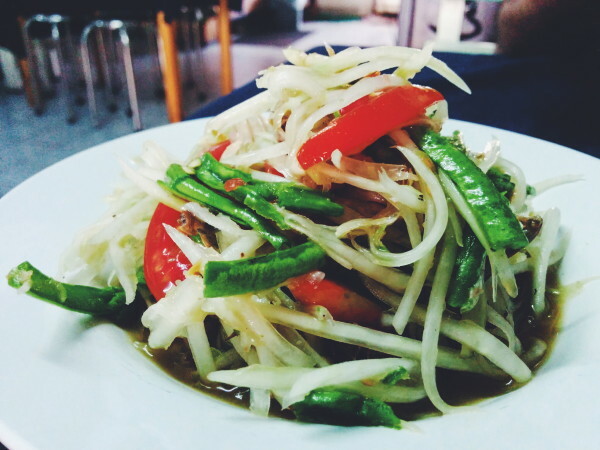 We started off with a green papaya salad with salted crab – it was excellent. 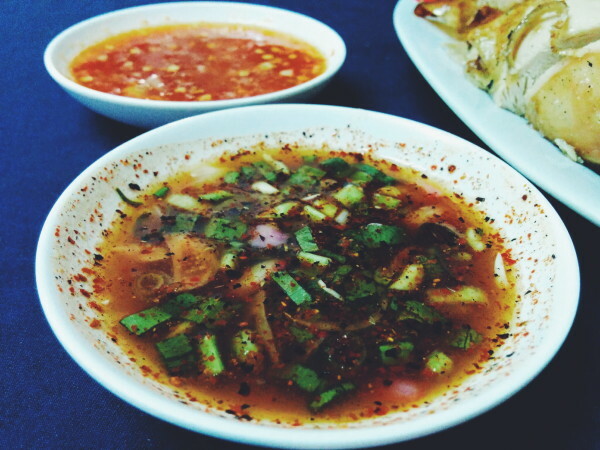 Thin strips of semi-sweet papaya with long beans, tomatoes and hot chilies were balanced with crunchy crab legs, making this a nice spinoff from the more commonly seen dressed down papaya salad. 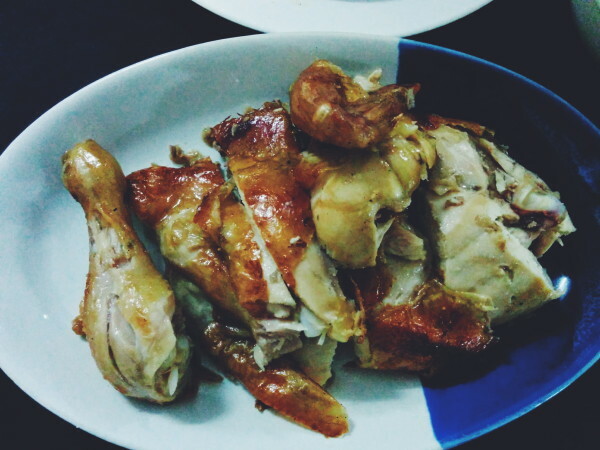 Then of course, the famous whole roast chicken. These birds are smaller than you’d think, but small doesn’t have anything on the colossal amount of flavor packed into every single bite. Tender, juicy, delicious meat right off the bone, popping with spicy/savory/sweet notes all at once. 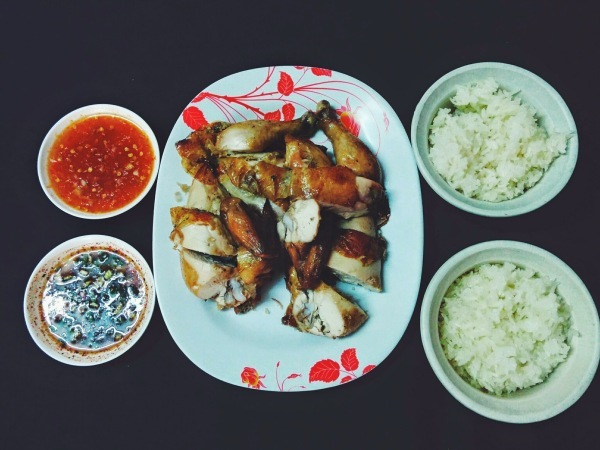 Dipped in the inimitable SP Chicken sauce (one sweet, one spicy) and a mouthful of sticky rice… Truly heavenly. Close-up of the sauce. By the end of meal, we straight up slurped what was left of the sauce directly out of the bowl. It’s that good. Round two at nighttime, we ordered the chicken again, except this time a half portion to leave room to try other dishes on the menu. 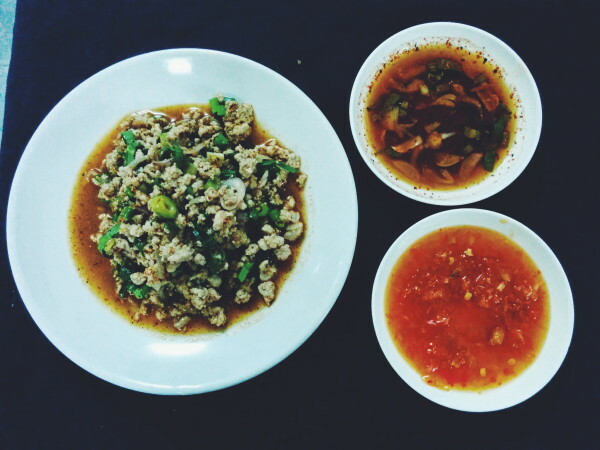 We tried the spicy pork minced salad – very nice as well, paired with the omnipresent, go-with-everything sticky rice. F’ing good. 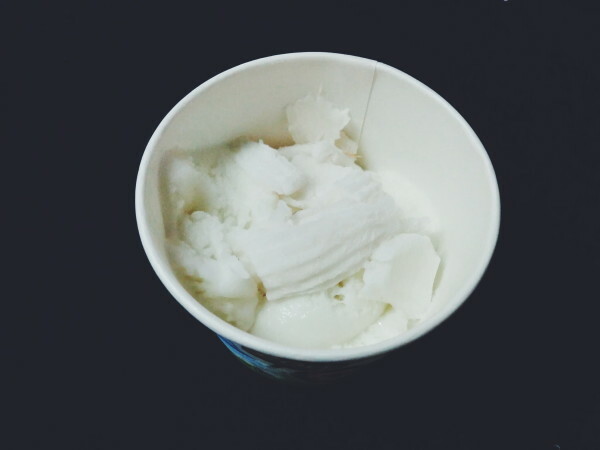 To finish off, a cup of homemade coconut ice cream. Refreshing, light and almost like a palate cleanser for a sweet ending to a delicious meal. Tags: Chiang Mai, Chicken, Dinner, Grilled Chicken, Lunch, Snack, Thailand.